Please contact O’Leary Guitars for current instrument pricing. For international orders shipping and insurance are extra. A 10% deposit is required at the time of ordering. This may be paid by bank transfer. Deposits are non-refundable. Please note there is a waiting list for these instruments and the delivery time given is approximate with 3 weeks. Balance is due before the instrument is delivered. 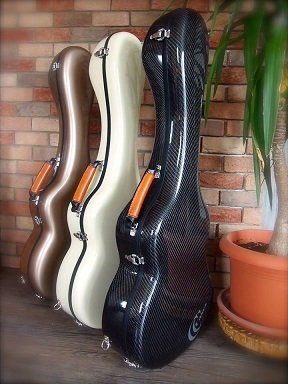 Base price includes hard shell Professional Hiscox case and quality tuning machines. The case is made from superior italian 100% carbon. We were not aware anyone who is using this kind of carbon fiber. This case is indeed very strong and also very light for daily wear. 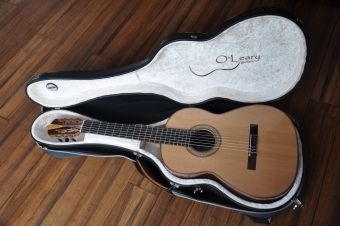 It is custom made for your O’Leary Guitar and provides excellent protection. Its strength to weight ratio is unrivaled. you get with this case! This case comes with built in hygrometer, embroidered O’Leary logo, case cover and uniquely designed back straps. Please contact us for current pricing: contact page. 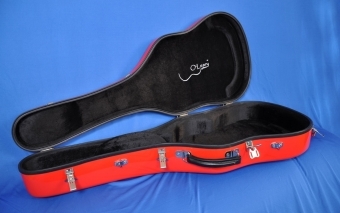 Also custom built for your O’Leary guitar we offer the Karura SafeFlight Artist Series case is exquisitely designed and trusted by world renowned travelling musicians guard against heat, cold and moisture. Interior: The Karura SafeFlight Artist Series case is hand-styled with a beautiful custom fit interior of crushed velvet. 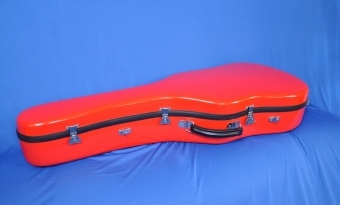 The standard velvet colour is raspberry red with a unique embroidered O’Leary Guitar logo. The picture here shows a black interior with a custom exterior colour. An “Allure” finish provides a beautiful, smooth and lustrous surface that adds a touch of to the elegance of the case. The allure finish is produced by eliminating all visible composite material patterns and applying a high quality 2-pak coating. This strong and functional guitar case is available as standard in black and in white. You can customize the interior and exterior colours as required for small additional charge.